Toca Boca comes to Android at last! If you’ve followed this blog for any length of time, you might have noticed me talking about Toca Boca before. I’ve reviewed their apps, and they’ve also made it into my top apps for preschoolers list. They are one of the few app developers where I will buy everything they produce as soon as it’s available. Not only are the apps beautifully designed and really intuitive to use, they encourage really open and creative play, rather than trying to take children down a pre-defined path. They also appeal to a wide range of ages – the geekson has been playing with them since he was 2, the geekdaughter at 5 still plays them, and we know several 7 or 8 years olds that still love them. Toca Boca apps are also one of the examples I cite when I tell people that iOS has better apps than Android. Because for years they have only developed for iOS. However this week that’s all changed. This week they’ve released the first of their apps on the Android platform. 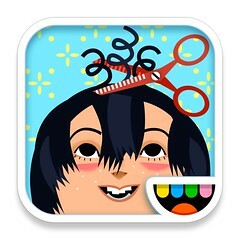 Toca Hair Salon 2 is one of their most recent app releases where you get to play at being a hairdresser. You select your customer, and can then use a range of tools to change their hair – brush, comb, curl, straighten, cut, extend, colour – add accessories and keep messing with it until you like it, and then take a snapshot. Even better as a special launch offer the app is discounted by 66% to a mere 64p in the UK Google Play store for a “limited time”. I’ve no idea how long this pricing will last, so I strongly recommend if you have an Android device and young kids that you head on over to the Google Play store and grab yourself a copy. I very much hope that this the start of Toca Boca making all their apps available on the Android platform. And if you’re an iOS users and don’t have a copy of this great app yet you can grab it from the iOS app store (affiliate link) where it is currently on sale at 33% discount at £1.49. This blog post is also available in enhanced audio format – you can listen in the player below, or, if it’s not available, click on this link to listen on the Audioboo website. Why Install the Amazon App Store on an Android Tablet?